The middle two girls share a room – a room which has not been painted since the day it was built, when it was squirted with a thin layer of eggshell-finish paint in “bone”. 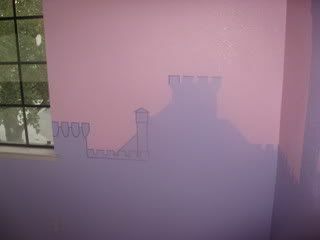 Closet doors are painted – it’s hard to see here, but the battlements are carried through the closet as well. Still a lot of this part to go and it’s all my husband’s job – putting in the finer details, gothic arches and such, in the darkest purple. I hope this comes through on your screen, because it is freakin’ AWESOME! Yes, that’s right: It is now officially the Princess Room. And damned if he didn’t. You’d think after thirteen years (almost to the day) with this guy I wouldn’t be surprised by any of his talents anymore, but no – I’m still regularly surprised and impressed by him. There are a bunch more details yet to go. Obviously there is still a lot of fine-detail painting to do, but we also have a set of shelves to install and possibly a desk. The desk I wanted to put in Captain Adventure’s room won’t fit anywhere (feh), so I may be giving it to the middle two girls instead for their room (ha! I defy you, Lack of Space!!) and moving my tiny secretary from downstairs in the hall into his room. When he’s a little older, because it’s one of those “sentimental” pieces that I’d really rather didn’t get chewed up too much. At least not, you know, right away. The total cost was just under $500. Four gallons and one quart of paint, new window treatments (on the way, white wood slats with cordless lift – pricy, but ultra slick), four 12x36” shelves with decorator brackets (oo la la! ), a set of six lined baskets, a new light switch plate and a whole lot of elbow grease – although we did kind of take it easy and didn’t exactly push ourselves. There were breaks to go out to lunch and get haircuts and even a long break in which we went and checked out model homes nearby. (I figure in another six months, they will be paying me to buy one – the prices have dropped over $100,000 (!) in one year, and there was nobody looking at them except one realtor). And I cannot express how good it felt, seeing that awful ‘bone’ (and assorted dings and other marks) vanishing beneath a crisp coat of primer, or how much of a giggle it gives me to peek in at the castles on the walls. Now we just have Eldest’s room, our master bedroom, and two bathrooms to go before we start on the flooring…just a l’il bit of nothing left, right?! Now that's a weekend well spent. Congratulations. beautiful - I'm sure the girls are loving it! Freakin' awesome indeed!! That is a great room. I will not be showing the pictures to anyone here, for fear we will have to paint. Great job! Gads, I love paint - the stuff is like magic. I bet the girls are loving it. A little ibuprofen and some chocolate for those shoulders, though, eh? That is so cool. I was never into princess stuff and *I* want to move into that room. Now. 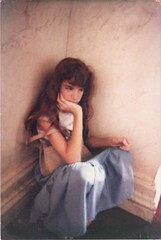 As an adult. And freehand? Wow. I am very impressed. Great job! 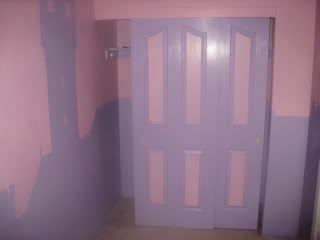 I don't have any daughters (three boys), so in all the hundreds of gallons of paint I have put on the walls, there has never been so much as a quart of pink or purple. Lots of blue. Lots of green. Lots of yellow. 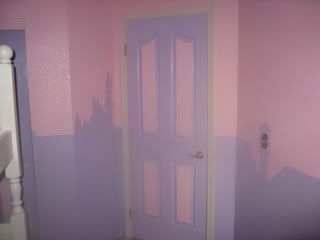 I think I'll paint the master bedroom purple. With castles. Gorgeous!! Kudos to your DH for castles well-imagined and painted! I'll bet they love it for years. Wow! That is gorgeous! But you're gonna have to stop this because instead of just lobbing paint on the walls like any SANE person would do, you created a GORGEOUS fantasy bedroom your daughters will be in heavon over! Now knock it off, you're making the rest of us look bad!